Hong Kong: Spring. The happy couple asked for a glamorous and elegant wedding. RSP suggested a mauve colour scheme to take advantage of the fabulous flowers available with which to create luxury with abundance. Once inside the reception, guests were treated to a sumptuous Chinese banquet within a fabulous room. Lighting effects cycled the colours through the purple and blue spectrum that was projected onto the soft white drapes. It kept the mood interesting all night. A jazz pianist playing a baby grand piano with classics that kept the dinner conversations upbeat and got dancers to their feet afterwards led the band. 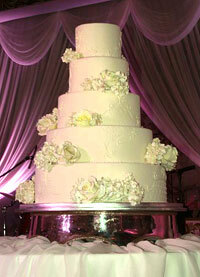 The bride and groom cut into the five tiered, 1.5 metre tall cake later in the evening. RSP Weddings are big affairs for couples that want a lavish and totally unique party. In the past we’ve designed a two metre tall wedding cake in nine tiers to bring scale to the Exhibition Hall venue and organised Indian wedding parties that run into multiple events over a course of days in multiple countries. We’re romantics at heart and know that every romance has a story and that those stories are driven by passion. It’s those passions and stories that create the inspiration for the moods which RSP translates into a personal celebration that friends and family can share forever.